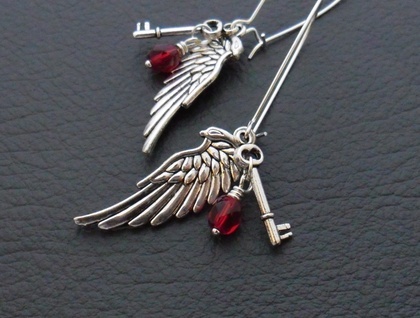 Antiqued-silver coloured wings, with beautiful feathering, are paired with tiny silver key charms, and hang from elegantly arched, silver plated ear-wires. Dangling from each little key charm is a garnet-coloured bead of firepolished Czech glass. Czech glass is famous worldwide for its high quality, and firepolishing is a technique whereby the beads are 'polished' by subjecting them to a very hot flame, creating a bright, shiny surface. Firepolished glass sparkles almost like crystal. 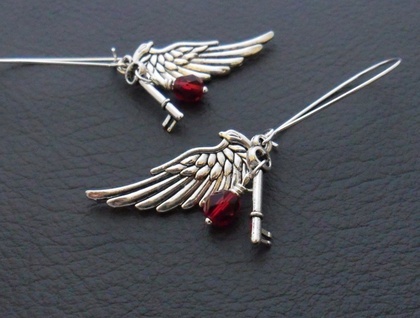 The wing and key charms are double sided: the details are the same on both sides. 'Altan' is a Turkish name that means 'red dawn'. The 'Altan' earrings measure 64mm from top to bottom. 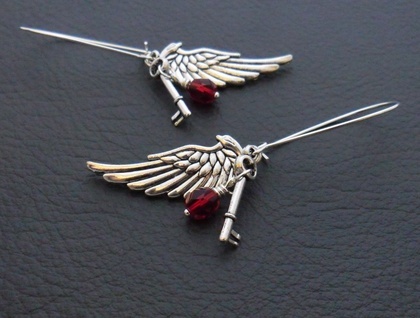 The wing charms are 34mm long, including the baile (the hanging loop at the top), and 12mm across at their widest point. 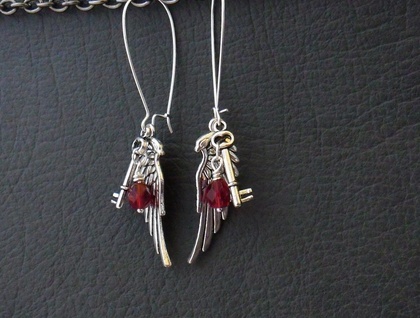 The ear-wires are made of brass plated with silver, and are without nickel.